Wednesday, July 25, 2018 at 10:55 a.m.
SR 92 is reopened to traffic following extended closure at N. Machias Road. Just like they needed a bigger boat to bring about the end to “Jaws,” we need to carve out a bigger Little Pilchuck Creek. While we’re at it, we also need to build a bigger span over the creek, running just under SR 92 in the Lake Stevens area. The 12-foot box culvert over Little Pilchuck Creek under SR 92 is funneling the water too quickly, making it virtually impassable for migrating fish. 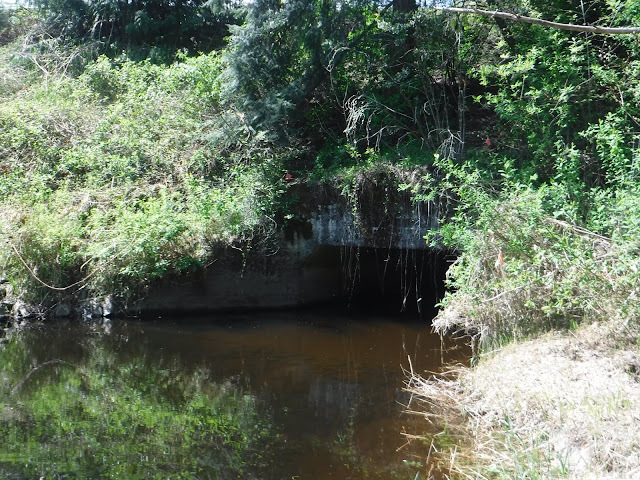 As it is, the 12-foot box culvert funnels water too quickly, making it very difficult for migrating trout and salmon to traverse. So we’re building a bigger fish passage. Redirecting Little Pilchuck Creek and widening its path will slow down the speed of the water. This makes it easier for migratory fish to swim through and spawn. The project also restores the creek to its natural state, helps us comply with a U.S. District court ruling regarding historical tribal fishing rights, and expands fish access to almost 30 miles of habitat. After Fourth of July festivities are wrapped up, our contractor crews from Graham Contracting will need to close the intersection of SR 92 and North Machias Road for 13 consecutive days, from 8 p.m. Friday, July 6 through Thursday afternoon on July 19. During the closure, we will redirect Little Pilchuck Creek to its natural creek bed, demolish and block the old box culvert under SR 92, assemble the 20-plus pieces that will become the new 60-foot buried bridge, bury it, then pave a new roadway on top. There will be two detours, one for cars, small trucks and bicyclists, and another for large commercial trucks. Both will be signed during this upcoming closure. Please be prepared to add some extra time to your trips while the detours are in place. What was accomplished during the first two weekend closures? The back-to-back closures of SR 92 at North Machias earlier this month allowed our crews to pump “jet grout” into the hillsides along Little Pilchuck Creek. 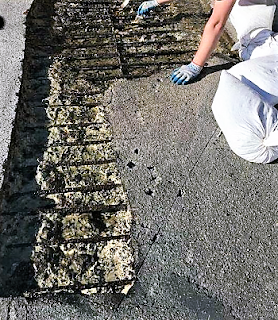 When this environmentally-safe grout mixed deep in the soil, it hardened, creating a stronger foundation to support the weight of the new 60-foot bridge. That bridge is what we now need to install as part of the 13-day closure. trestle used to do some stabilizing work on the hillsides of SR 92 and North Machias Road. Be prepared for the drive between Lake Stevens and Granite Falls to take longer than usual. We know there’s no good time to close a highway, and we thank you in advance for any adjustments you make to help us complete this important environmental project on SR 92. It’s only been a few weeks, but the Revive I-5 weekend closure at the start of June on northbound I-5 south of downtown Seattle seems like a distant memory. Well, here’s a reminder that more work is to come – we’re only about two weeks out from the second and final full closure of northbound I-5 at the West Seattle Bridge/Spokane Street/Columbian Way off-ramp. Ramp and lane closures will begin at 8 p.m. Friday, July 13, with all northbound lanes closed at the West Seattle Bridge by 10 p.m. The closure will continue through 5 a.m. Monday, July 16. As always, this closure is weather dependent. the off-ramp to the West Seattle Bridge. Why close all lanes of northbound I-5? We need to replace the concrete in a relatively narrow half-mile section of northbound I-5, between the West Seattle Bridge/Spokane Street/Columbian Way on- and off-ramps. The interstate is four lanes wide, with very narrow shoulders. There is simply not enough room in this section to provide a safe buffer between traffic and the work crews. The only practical solution is a total closure in that area. During the weekend of July 14-15 crews replaced about 3,500 feet of concrete across two lanes. We’re actually doubling our efforts out there with this closure. We’ll repave near the West Seattle Bridge and downtown, as well as replace several expansion joints. 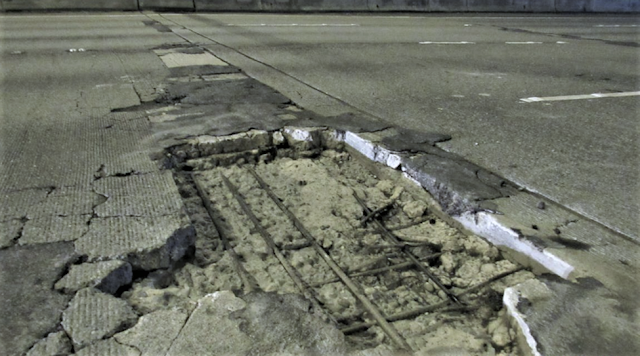 We also need to replace an expansion joint on northbound I-5 at the Duwamish River. Close all the northbound I-5 on-ramps between Southcenter and South Michigan Street. Leave all off-ramps open between Southcenter and the West Seattle Bridge. Traffic on northbound I-5 was fairly light most of the first weekend full closure. Alternate routes saw much heavier traffic. How was traffic during the first northbound closure? 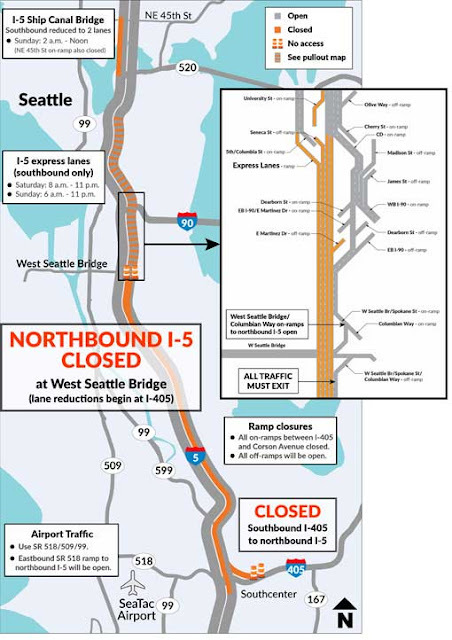 When we did similar work during the first full northbound closure the weekend of June 2-3, northbound I-5 actually wasn’t unbearable because drivers realized that they would have to get off at the West Seattle Bridge. That led them to use alternate routes. We did see bigger than usual backups on alternatives like SR 99 and SR 509, and particularly on I-405 as people worked to get around the closure. By late Sunday afternoon, the I-405 backup stretched from Kennydale to I-5. The surface streets in south Seattle also were often crowded. People will need to adjust their travel plans again. What traffic looks like during our next northbound closure weekend is largely up to you. During the June closure, 70 percent of people who usually use this section of I-5 did something else. If you use alternatives and limit your driving south of downtown Seattle, there will still be some delays throughout the SeaTac-Burien-Tukwila-Renton area. If people try to use the highway system like a regular weekend, expect horrendous backups everywhere. 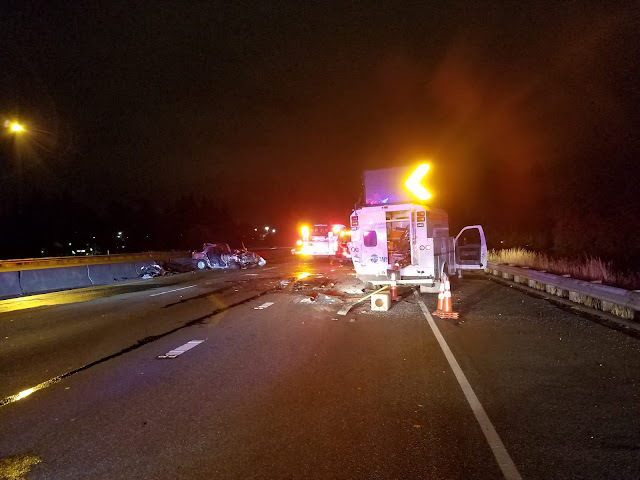 Plan ahead: you can get real-time traffic information about Revive I-5 on your phone with the WSDOT traffic app and by tracking #ReviveI5 on the WSDOT Traffic Twitter feed. Even with the work on northbound I-5, drivers will be able to get to and from West Seattle all weekend. Everyone will exit northbound I-5 at the West Seattle Bridge off-ramp. 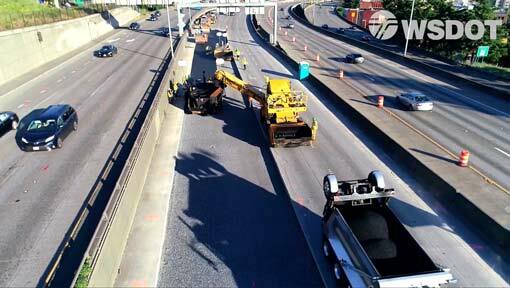 The northbound I-5 on-ramp from the West Seattle Bridge and Columbian Way will be open all weekend. One lane of traffic from that ramp will go to the collector/distributor, where drivers can exit to I-90, James or Madison streets, or continue through the C/D to rejoin the northbound I-5 mainline. We’re getting closer to finishing the weekend-long lane reductions. If the weather allows us to work the weekend of July 14-15, we’ll still need a couple more weekends to complete all the work that requires lane reductions. Once the weekend-long closures are complete, the project still has a long way to go. Our contractor will continue to work nights through fall 2019. They’ll grind the concrete to eliminate ruts in the 52-year-old interstate all the way to Northeast Ravenna Avenue, pave several ramps and complete other work. In the end, our contractor will rehabilitate about 13 miles of northbound I-5. It’s a long, tough job, but it will keep I-5 in good shape for decades to come. We're in the middle of another busy construction season, and we're getting a lot of important work done. We know it's not always easy to have to adjust your travel plans and it can be frustrating waiting in a backup when a lane is closed, and we appreciate your patience and cooperation. We also have some requests. Some of our projects require lane closures with alternating traffic, often led by a pilot car. That means vehicles not being led through the closure have a bit of a wait. We know it can be tempting to exit your vehicle to stretch your legs or take a look at how traffic is moving from the opposite direction. But please, resist the temptation and stay in your vehicle. Having people outside their vehicles near work zones while traffic is passing can be a recipe for disaster. It's simply not safe to have people walking near or in construction zones. We've seen near-misses where people outside their vehicles waiting to get moving find themselves too close to vehicles being led through by the pilot car. Sometimes the person outside their vehicle is distracted by being on their phone or otherwise not paying attention, and doesn't realize that traffic is now passing through. People wandering near the centerline combined with passing vehicles is a recipe for tragedy. Even if you're being led at low speed by a pilot car, if you're operating a motor vehicle, you can do serious damage to yourself or others if you aren't focused on the road. It only takes a second of inattention to drift into a work zone, potentially hitting a worker or piece of equipment. You also may find yourself following too closely and in a fender bender and/or not paying close attention to your speed. near a work zone, but it can also create dangerous situations. Remember, while we've had plenty of workers either hit or nearly hit in work zones, 96 percent of people hurt in work zone collisions are the driver, their passenger or passing pedestrians. Traffic fines are also doubled in work zones. So it's in your best interest to keep your eyes on the road. The crews working on road projects, the patrol officers helping with traffic control, and the pilot car drivers safely leading people through the area, are all working to keep our highways safe and smooth. It's a tough job working near traffic, knowing that some people are distracted and many people are frustrated. But please, try to remember that all of the people out there are spouses, children, parents and friends and they all want to go home safely at the end of their day. So besides staying focused, remember to give road workers space whenever possible, slow down and be patient. They will try to get you going safely on your way as quickly as possible. We don’t like it either. If we asked Snohomish County travelers to pick a children’s tale they feel embodies the US 2 preservation project, we would not be surprised if “The Boy Who Cried Wolf” won by a landslide. Four times now we have spread the word of six weekend closures of westbound US 2 between the SR 204 interchange and Homeacres ramp. Four times the forecast hasn’t been in our favor. Four times we’ve had to postpone the closures hours before their start time. Rain is the culprit. Its trickle-down effect has disrupted routines, plans and frustrated drivers and contractor crews alike. We all want to finish the six closures for this project. We all want the Hewitt Avenue trestle rehabilitated and preserved so it can be in a good state of repair for years to come. While many of our projects can continue in the rain, this is not one of them. The waterproof material we need to put down to prevent rainwater from seeping into the concrete bridge deck and corroding the rebar has to be applied when there is NO rain or moisture AT ALL on the bridge deck. First, the primer used to attach the waterproof coating to the bridge deck won’t stick if there is moisture on the concrete deck. Moisture prevents the primer from bonding and the coating from sticking correctly. Secondly, applying the material when there’s a hint of moisture, then putting hot asphalt on top of the waterproof coating creates steam. That steam can expand, creating bubbles or separations between the bridge deck and asphalt. This derails some major goals of this project which include, but aren’t limited to: removing cracks and potholes (versus creating more of them), and providing a smooth ride on the newly rehabilitated trestle. For these reasons, applying the material when there is any moisture voids the warranty. No one wants that. 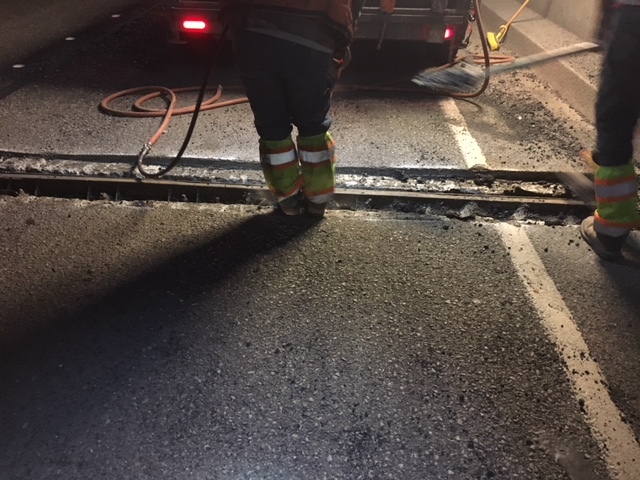 I’ve had a few of you ask why we can do Revive I-5 paving work when it rains a little in Seattle, but we postpone what appears to be similar paving work on US 2 in Snohomish County. It’s because the waterproofing material is only used on bridge decks. The Revive I-5 project only involves a little bit of bridge deck work. That project also postponed a weekend ramp closure in April when rain was expected. Our crews can get a lot more work done during a full weekend closure than during a quick, overnight closure. Overnight shifts only provide a few hours to get work done before we have to pack up our equipment and get off the roadway in time for the morning commute. Weekend closures help shorten major preservation projects such as this one, and get commuters and commerce back on Washington’s freeways in a shorter amount of time. Everyone involved in this project knows the odds of having bone dry weekends – in the convergence zone - during May and June - weren’t in our favor. Our dry “construction season” is already limited here in the Pacific Northwest, between coordinating with other road closures, events and holidays. Still, we tackled this US 2 weekend closure schedule with an optimism usually reserved for romantic comedies and started with the hopes of closures in the spring. By now you know this, but it bears repeating: These closures are weather dependent. For the first four weekend closures we will reverse traffic on 20th Street Southeast. Westbound US 2 traffic between Lake Stevens/Snohomish and Everett should be prepared to use a detour during the full weekend closures of the trestle. Our website will have closure and lane reduction updates. Get weekly email updates on King and Snohomish County projects. There’s no good time to close an entire direction of US 2. However, doing this extensive preservation work will reduce the need for future emergency repairs that add time to already long commutes in Snohomish County. We appreciate any adjustments you make to help us complete this important rehabilitation work. We also thank those of you who indulge in any personal superstitions you believe will help ward off rain clouds. 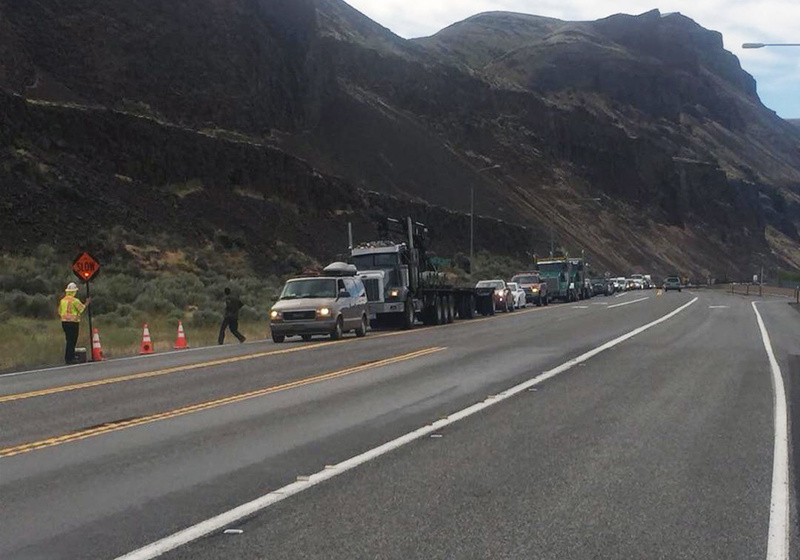 Anyone who has driven US 195 between Spokane and Pullman regularly – including decades worth of Washington State University students – has been stuck behind a slow-moving vehicle at some point. I always seemed to end up behind a hay truck or other farm equipment during my travels. The rolling hills of the Palouse are beautiful scenery, but the winding, two-lane road with few good options for passing can be frustrating, especially when thousands of students are trying to get to and from campus. But, relief is on the way – by the end of this summer six passing areas will be available to ease traffic flow. The US 195 Passing Lane project was paid for in the Legislature's Connecting Washington funding package to alleviate the potential for head-on collisions along the highway. Two passing lanes were added near Colfax last summer and four more between Colfax and Spangle are under construction this summer. US 195 this summer should stay alert and be prepared to slow down near work zones. Giving travelers a space to safely pass slower vehicles improves safety for all and should cut down on the number of vehicles held up by one slow vehicle. The improvements also are another step toward reaching the state's Target Zero safety plan of reducing traffic fatalities and serious injuries to zero by the year 2030. Of course, right now the work means there are several construction zones and some traffic delays as crews create the final four passing lanes. Several bridge decks are also being repaired and resurfaced in an unrelated project near Rosalia and Steptoe that will wrap up in July. (The bridge work was timed during the passing lane work to minimize the amount of time we have work zones in the area and the inconvenience to travelers by not having construction sites next summer as well.) Both these projects mean there are single lanes of traffic in some areas, with travelers waiting until one lane has cleared before driving through the construction zone themselves. Anyone traveling the highway should allow extra traveling time. Left: A completed passing lane on US 195 allows slower traffic to move over while the rest of traffic passes by. Right: Slower trucks use one of the passing lanes completed on US 195 in 2017. We know single-lane traffic adds some time to trips this summer, but we ask for everyone's patience while we improve the highway for all travelers. Work should be wrapped up by the end of the summer and ready for the WSU students, parents and alumni who frequent the highway throughout the school year. This year, their travel should be a bit smoother. Let me guess: Some of you just cringed and some of you smiled. Few subjects we talk about elicit as big of a response as roundabouts. Some of you love them. Some of you...don’t. There are already more than 100 roundabouts on our state highways. For some of you, that is 100 too many, and for others, it’s not nearly enough. Well, the truth is, roundabouts make sense in some spots but not in others. In areas where there is a very heavy amount of traffic on the highway and side streets and where there are a series of traffic signals leading to the intersection, it may not make as much sense. But there is no one-size-fits-all answer. This year, we’re building roundabouts in Pacific, Skagit, Snohomish, Spokane and Whatcom counties. We don’t take these projects lightly. We study the area, traffic patterns and number of vehicles who use the area –among other things – before deciding what improvement makes the most sense. We talk to people who regularly travel through that area, consider future growth and available budget and come up with a plan. So why use a roundabout at all? Safety, for one. Intersections with roundabouts lower the number of possible conflict points between vehicles and reduce the speed of vehicles. Roundabouts lower the risk of deadly crashes by 90 percent, and serious crashes by 75 percent. Roundabouts also help keep traffic moving. Travelers don’t need to wait for a green light. Instead, they just yield to traffic already in the roundabout, so the intersection can handle more traffic in the same amount of time. as they’ll help you choose your lane in advance. Finally, roundabouts are less expensive than building bridges, ramps, overpasses and underpasses. With many, many highway needs throughout the state, we need to find ways to make available funding go the furthest. While the first roundabout in the United States was designed in 1907, common use of modern roundabouts in this country didn’t really start until the 1990s. So it’s not surprising when people express concerns about using them. For some people, they simply didn’t grow up using them when they were learning to drive. We get it, there can be a learning curve. Adding to the confusion is that not every roundabout is the same. Some have one lane, some have two. 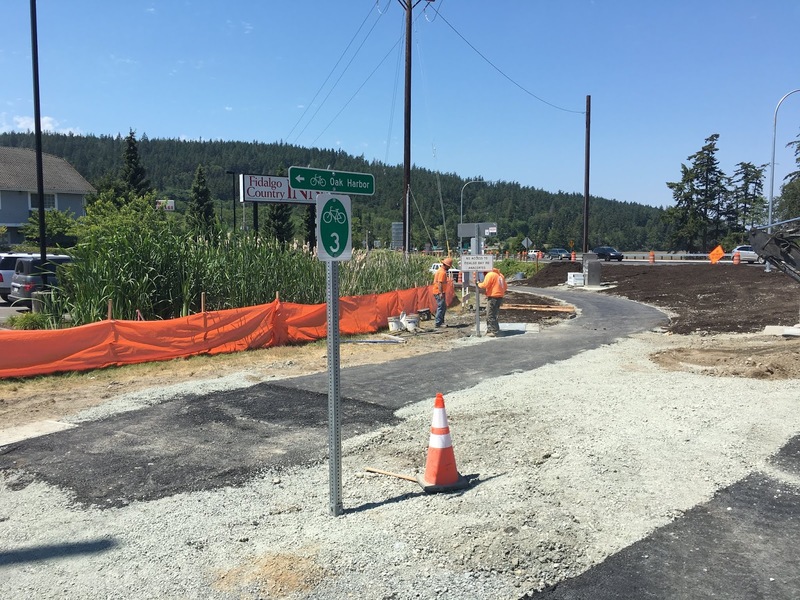 Improved pedestrian and cyclist access are part of any new roundabout construction. Be alert to those using crosswalks or nearby trails. Yield to vehicles on the left. Vehicles already in the roundabout have the right-of-way. They will always be coming from your left. As you near the roundabout, pay attention to the yield sign and slow down. If a vehicle is already coming, yield. If not, enter the roundabout to your right (never enter to your left!). Pick a lane. If it’s just a one-lane roundabout, this is easy. If it’s two lanes, be sure to pay attention to the signs as they will direct you which lane to choose. If you pick the wrong one, just continue to circle the roundabout, signal, and safely move into the correct lane. Signal. When you’re ready to exit the roundabout, signal as you would any time you make a turn. This lets vehicles behind you and vehicles waiting to enter know your intention. Watch for pedestrians/bikes. Many roundabouts have crosswalks as well. Be sure to be alert for anyone needing to cross. Give larger vehicles extra room. Semis, large RVs and other large loads may need extra room to move through the roundabout. Work together to keep everyone safe and moving. Keep moving. Don’t stop in the middle of a roundabout. That’s often how collisions happen. If you think you missed your exit, just continue going around until you come back to it. Remember, vehicles already in the roundabout have the right-of-way. People navigate through a recently completed roundabout at SR 20 and Miller Gibralter roads in Skagit County. Still unsure. We have a five-part video series that goes over maneuvering through a roundabout that may help. Simple, right? Yield to traffic already in the roundabout, enter to your right, signal to exit, pay attention to signs and watch your speed. Several roundabouts are currently under construction or will be soon. 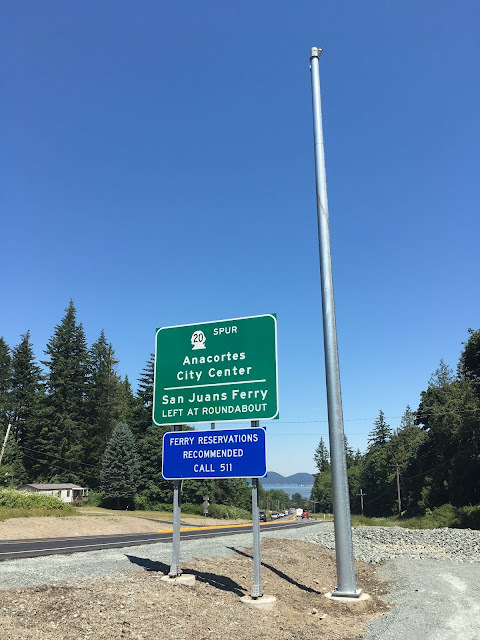 The SR 20/SR 20 Spur area in Anacortes now has two new roundabouts open. 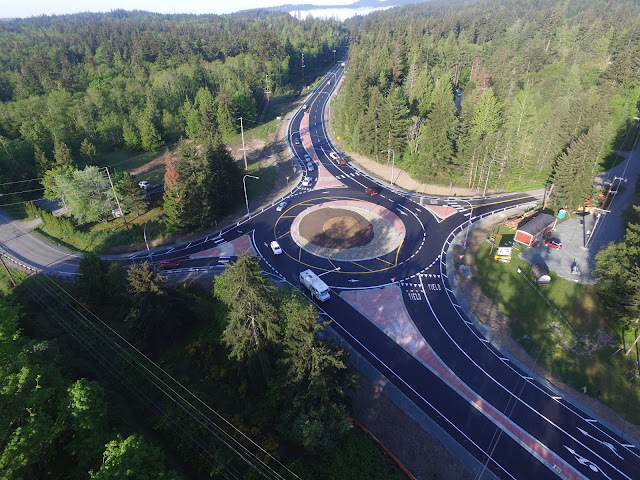 These roundabouts in Skagit County will improve safety for those who live or visit the Whidbey Island, Anacortes or San Juan Island areas and shorten wait times through the popular corridor. The Clear Lake area of SR 9 near Sedro-Woolley, SR 548/Grandview Road and SR 542/SR 9 East Junction in Ferndale, SR 9 in Marysville and SR 524 in Snohomish County are all getting roundabouts this year. In Pacific County, US 101 in Raymond is getting one, and so is US 395 in Deer Park. We know roundabouts aren’t popular with everyone, but we also know they improve safety and traffic flow. It just takes a little understanding on how to use them and everyone working together, and we’ll see improvements at all of these interchanges. The three-week SR 99 closure is set to begin on Jan. 11, 2019. Learn more about the decision to stick with the previous timeline of an early 2019 tunnel opening on the Alaskan Way Viaduct Replacement Program website. The new SR 99 tunnel beneath downtown Seattle could open as soon as this fall, providing a direct route from CenturyLink and Safeco fields to the Space Needle. 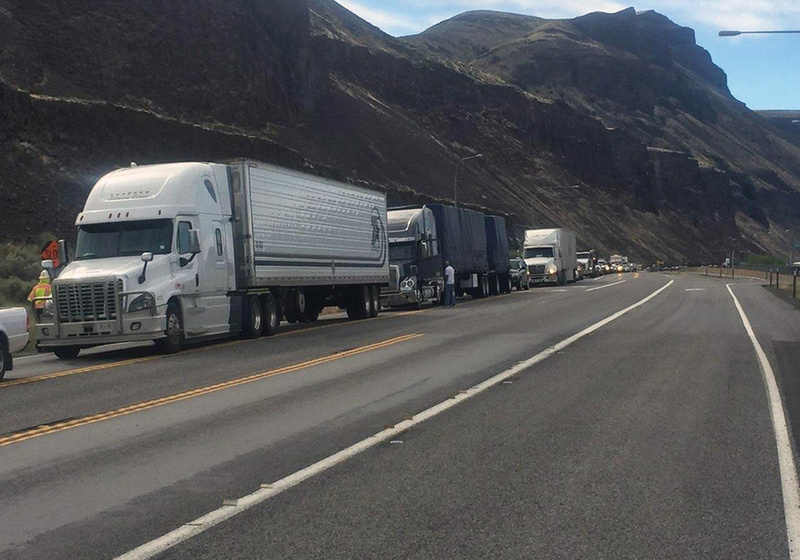 There's a lot of work that has to happen before we can give you an exact date for the tunnel opening, but one thing we can tell you is travelers will face big challenges immediately before the tunnel opens. We must close the viaduct before we can open the tunnel – there's no other way to connect SR 99 to the new tunnel. That means there will be three weeks of no SR 99 traffic through Seattle – no viaduct and no tunnel. Why do you have to close the viaduct before the tunnel opens? The current alignment of SR 99 near the stadiums is temporary. Today's configuration allows traffic to weave through an active construction zone. After the tunnel is complete, tested and all systems are 'go', we will have to realign SR 99 and connect the tunnel ramps. This means we must close SR 99 from the West Seattle Bridge to the south end of the Battery Street Tunnel for approximately three weeks (if the weather cooperates). The pictures below explain why. The orange areas on the right show the areas where crews will have to work to build new ramps and road connections to open the tunnel to traffic. As you can see, these work areas sit right atop the present-day highway. The intensive amount of work required at the tunnel's south end near the stadiums means that key ramps will close sooner and open later than the rest of the highway. For drivers heading south, the current southbound exit to South Atlantic Street (for reaching the stadiums and interstates) will close approximately one week before the full SR 99 closure to create room for the realignment work. For your future planning, this exit will disappear entirely when the tunnel opens, replaced by a stadium/I-5/I-90 exit from the tunnel. For drivers heading north toward downtown, the new SR 99 northbound exit ramp to Alaskan Way and downtown Seattle will open two weeks after the tunnel opens, as this ramp will take longer to complete. If you're driving from the north during the closure, SR 99 will narrow to one lane in each direction near Mercer Street so crews can build a new section of highway connecting SR 99 to the tunnel (see picture above). The Battery Street Tunnel will remain open during the three-week closure, but drivers will have to exit and enter at the Western Avenue off and on ramps. It's a little hard to follow. Our program website has additional graphics showing the closure step by step. We know from experience that closing SR 99 through Seattle has a region-wide impact. During past planned closures, commutes on I-5, I-405 and I-90 started earlier and lasted longer. Seattle city streets were also more crowded. Many drivers pitched in and changed their commute times, but there's no question that three weeks is a long time to ask drivers to sustain change. Add some rain to the equation and traffic could become even more challenging. We are working with our partner agencies to identify multiple ways to help keep people moving during the three-week shutdown of SR 99, but there's no doubt this will be a challenging time for everyone. We will share more information as we get closer to a starting point for the closure. We don't yet have a date for this three-week closure, but it could come as soon as this fall. We will be able to give about a month's warning. Still, thinking about potential alternatives now can help you later. Maybe it's time to try a vanpool, bike, or walk the last mile of your trip to downtown. How about a water taxi from West Seattle or Vashon? Using your tools (pdf 488 kb) and having a game plan will be vital during the closure. We will have much more information about alternative ways to keep people and goods moving as the closure approaches. You may notice that this week’s Busy Weekend Map looks a little more... simple... than usual. There’s a reason for that! In honor of the popular “Throwback Thursday” trend on social media, this week’s map is paying homage to the one that started it all. This week's Busy Weekend Paint Map highlights events and roadwork with a significant effect on traffic, including the closure of westbound US 2 at the Hewitt Avenue trestle and Seattle Pride. Our first Busy Weekend Map made its debut just before Pride Weekend 2016. Despite its simplicity and – ahem – “unsophisticated” drawings, the map got a lot of attention. Two years and about a dozen maps later, it’s still one of our most popular Tweets. More importantly, it spawned the Busy Weekend Maps you’re used to seeing today, which have become one of the most popular ways we alert the public about events and roadwork that could affect their weekend travels on state highways. Our very first Busy Weekend Map for June 24-26, 2016. Even two years later, it's still one of our most shared tweets. 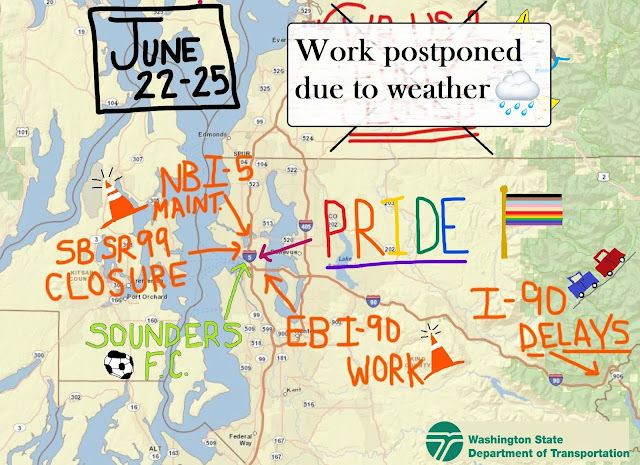 Large events will affect traffic: Expect lots of congestion in and around Seattle as people head to some big special events, including PrideFest and the Sounders vs. Chicago match. US 2: The westbound US 2 closure scheduled from 7 p.m. Friday, June 22, to 4 a.m. Monday, June 25, has been postponed due to weather. The work is rescheduled to the weekend of June 30-July 1. I-90: 24/7 lane reductions and traffic shifts on westbound I-90 will cause big travel delays for people heading either direction over Snoqualmie Pass. Pack extra water and snacks! SR 99: All lanes of southbound State Route 99 through downtown Seattle will be closed from 9 p.m. Friday to 6 a.m. Sunday for work related to the SR 99 Tunnel project. Know your alternate routes before you leave home. These Busy Weekend Maps are not meant to be a social event calendar. They are meant to show what events and construction work will significantly affect people who use state highways. The maps are just one of many tools we offer to help people know traffic conditions before they hit the road. We urge people to also check our Special Events Calendar page and Weekly Travel Planner for a more comprehensive list of events and roadwork happening near them. 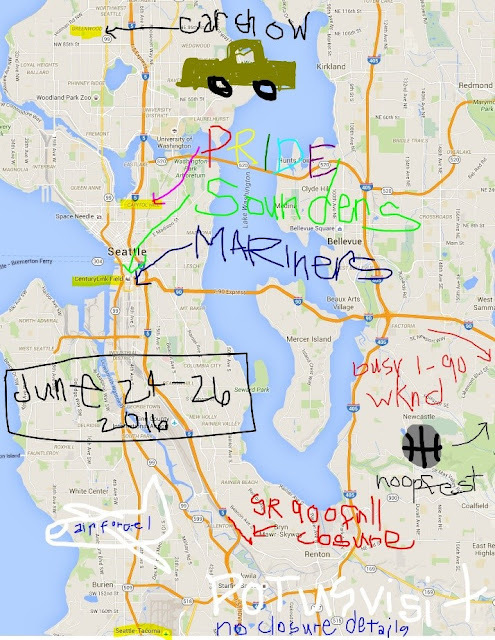 Checking our Seattle area traffic & cameras webpage. Following @WSDOT_Traffic on Twitter for real-time info. Between rain delays, holiday weekends and big events, it has been a while since we’ve had to prepare for a scheduled closure of westbound US 2 between the Lake Stevens/Snohomish area and Everett. That’s why, with back-to-back weekend closures scheduled from 7 p.m. Friday, June 22 to 4 a.m. Monday, June 25, and 7 p.m. Friday, June 29 to 4 a.m. Monday, July 2, now is as good a time as any to quickly show you what we’ve been up to. While some of our projects can get work done in the rain, this is not one of them. The two rain delays we’ve had so far are because the waterproof material we are using to protect the trestle from our wet weather has to be applied when there is NO rain or moisture AT ALL. Applying the material when there’s a hint of moisture voids the warranty for the waterproof coating, and nobody wants that. So we will continue to wait for those dry Snohomish County summer weekends. 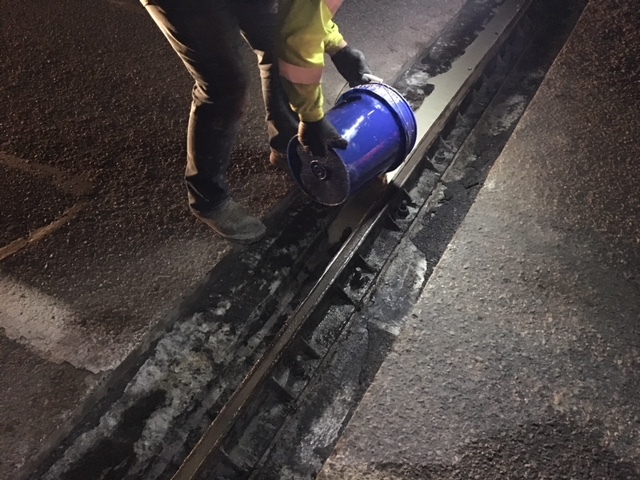 Between the postponed closures, weeknight westbound drivers on US 2 have likely seen the men and women of Lakeside Industries hard at work overnight, preparing the trestle’s dozens of expansion joints for our weekend closures. The trestle expansion joints are less than 50 yards apart, so we have to be precise in all the repair work. Our margin for error between the top of the road and the top of the expansion joint is just 1/8 inch. The difference between a smoother ride and an uneven, bumpy one is razor thin. Put down a new layer of asphalt on the far east end of the Hewitt Avenue trestle. By now you know this, but it bears repeating: This work is weather dependent. For the first four weekend closures, we will reverse traffic on 20th Street Southeast. 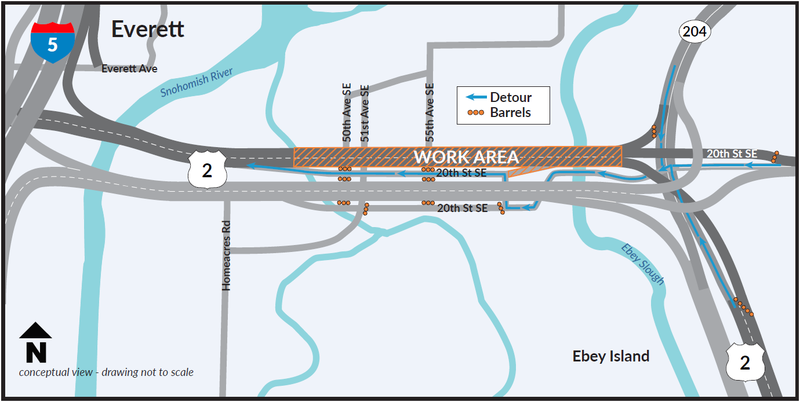 During the first four weekend closures of westbound US 2, travelers will be detoured westbound on 20th Street SE and returned to the far west end of the US 2 Hewitt Avenue trestle, just before the I-5 interchange. 20th Street Southeast is a single-lane road and doesn’t have the space to efficiently move all the travelers who will be booted off westbound US 2 during these closures. Brace for congestion. We expect nearby state routes 9, 96 and 528 to get slammed with travelers avoiding the US 2 detour on 20th Street. Move discretionary travel to a non-construction weekend travel during non-peak hours. Before 8 a.m. or after 8 p.m.
Be prepared. Check ahead before you get behind the wheel. We know there’s no good time to close an entire direction of a busy highway like US 2, and that these closures disrupt weekend travel plans. However, doing this extensive preservation work will reduce the need for future emergency repairs that add time to already long commutes in Snohomish County. We appreciate any adjustments you make to help us complete this important preservation work on US 2. Our construction projects often deal with rain delays, but a bird delay? That's a new one. And that's what happened when two red-tailed hawks nested on the SR 99 Aurora Bridge in Seattle, throwing off the original schedule to begin painting the bridge this spring. They say raising a child takes a village. The same could be said for raising a baby red-tailed hawk on a bridge in the middle of Seattle. Though the birds are common to the area, it's extremely rare for them to nest on bridges. Red-tailed hawks typically nest with their egg in trees in urban environments. Maybe a high rise at worst. Left: Peek-a-boo. Gerry, a young red-tailed hawk born on Seattle’s Aurora Bridge, gives us a look from a safe distance. Right: The SR 99 Aurora Bridge red-tailed hawks proved elusive for photos, but this is likely what they looked like. While we're caretakers of our highway infrastructure, we also work to protect wildlife. Ensuring the egg's survival meant coordinating state agencies and the contractor for the project, patience, and a bit of luck. These two lovebirds likely have experience landing a home in a housing market that can be tough even for hawks. The pair are probably the same birds that nested on the bridge during the first phase of the painting project in 2016. Unfortunately, the nest was built too close to where workers were already painting on the north side of the bridge, directly below the bridge deck. The nest was moved and the egg was given to the Burke Museum. "We wanted to prevent a similar situation this time," said biology lead Katina Kapantais. "So we kept an eye out for them. We saw them hanging out around the bridge, but we never saw a nest." A look at where two red-tailed hawks nested on the SR 99 Aurora Bridge, causing a bridge painting job to be delayed. Usually it takes red-tailed hawks a couple of weeks to set up a nest. This pair did it in three to four days during Easter this year. And they not only built their home during the holiday weekend, but also laid an egg. Kapantais said we initially thought we'd need to move the nest again, but instead the contractor – Liberty Maintenance – proposed working around the birds instead. They proposed a number of options and worked to adjust their schedule for a few weeks and limit noise to avoid disturbing the birds. The Washington State Department of Fish and Wildlife reviewed and signed off on the plan. And everyone's patience paid off. The egg successfully hatched in early May. The baby bird – which our contractor named Gerry – has already taken flight and left the nest for higher beams in the area. It'll stay near the nest for the next few months until it builds up enough strength to hunt and fly farther before moving on somewhere else. Even in ideal circumstances, baby red-tailed hawks have about a 50 percent chance of survival, Kapantais said. Many either flame out of flight school (a pass/fail course) or their parents simply abandon them and stop bringing food. "The fact that this one survived with roads and water below is great news," Kapantais said. "And it took a group effort." If you drive on State Route 167 in Renton near the Interstate 405 interchange, you may have noticed an imposing tower of big white blocks stacked in the median. Contrary to popular belief, they aren’t actually giant sugar cubes. 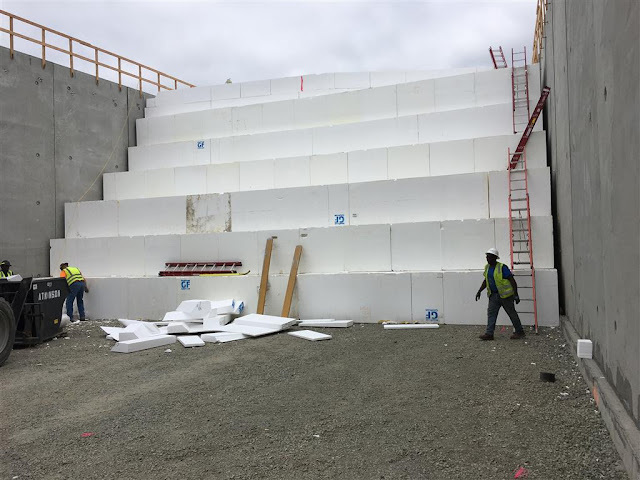 They are a material called geofoam that is critical to building one of the bridge approach ramps on the I-405/SR 167 Interchange Direct Connector Project. Nope, these aren’t giant sugar cubes. We’re using geofoam to build bridge approach ramps on our Direct Connector project. Why did we decide to use geofoam? 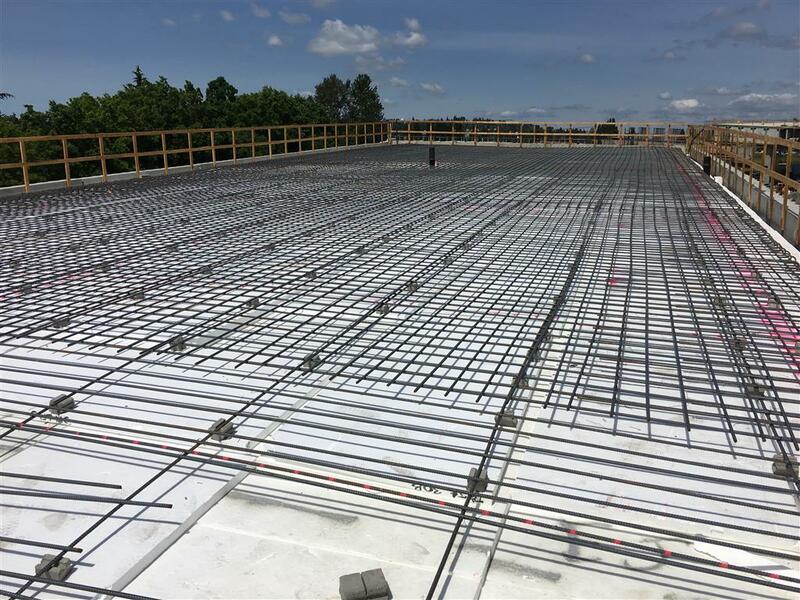 For those who aren’t familiar with the Direct Connector, it’s a new flyover ramp currently under construction that will connect the I-405 HOV lanes to the SR 167 HOT lanes. To take drivers up and over the interchange, crews need to build what we call approach ramps on each side. 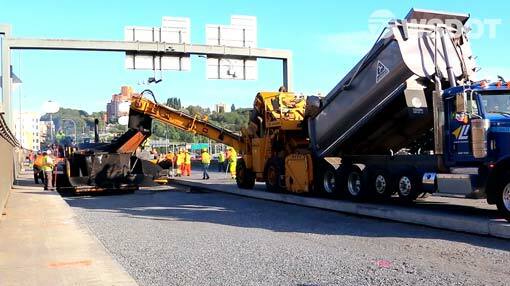 On the I-405 side, crews are able to use compacted soil to build the ramp. But they can’t use this same method as easily on the SR 167 side because the underlying soils are very soft and would settle or sink over time under the weight of the compacted soil. 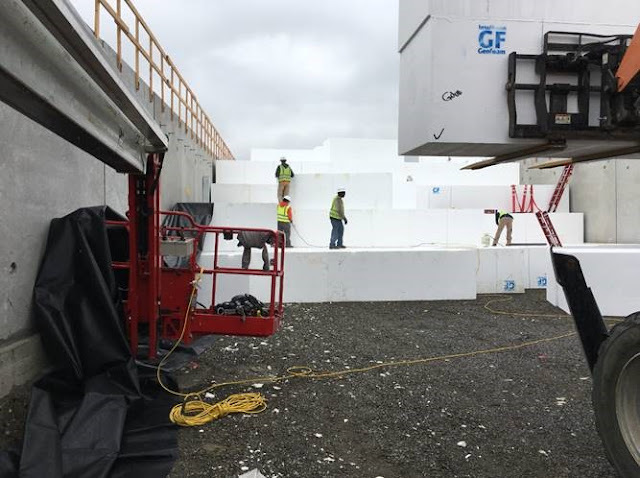 In this case, our contractor decided to use geofoam blocks instead of compacted soil to keep the project moving on schedule. Since late April, crews have been installing more than 2,700 blocks between the concrete walls of the SR 167 ramp, and their work is now almost complete. What are the benefits to using geofoam? Although you may not realize it when looking at a finished construction project, geofoam is actually quite common. 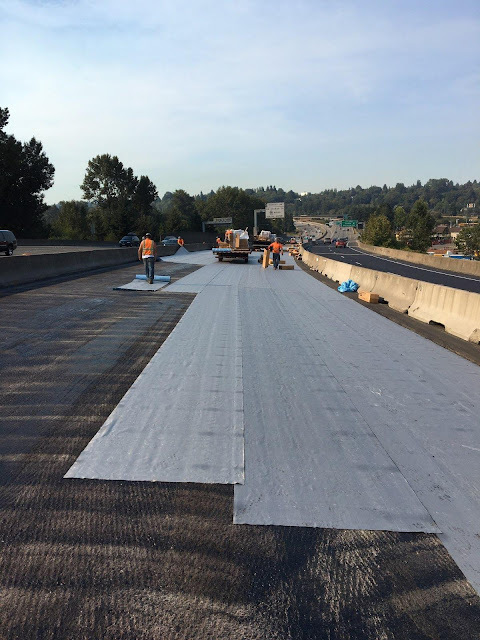 We have used this synthetic material on other construction projects, including the direct access ramp at the I-405/NE 128th Street interchange in Kirkland, on SR 519 near Safeco Field in Seattle, and at the I-405/NE 10th Street Bridge in Bellevue. The most common other fill material that we use — good old-fashioned dirt — would require more extensive work to improve the ground. Crews would need to bring oversized piles of dirt to the work zone and dump them onto the ground – a practice we refer to as surcharging or preloading – causing it to settle. This method can take longer and have higher costs because crews have to wait until the ground has settled before removing a portion of that dirt and building a structure on top of it. 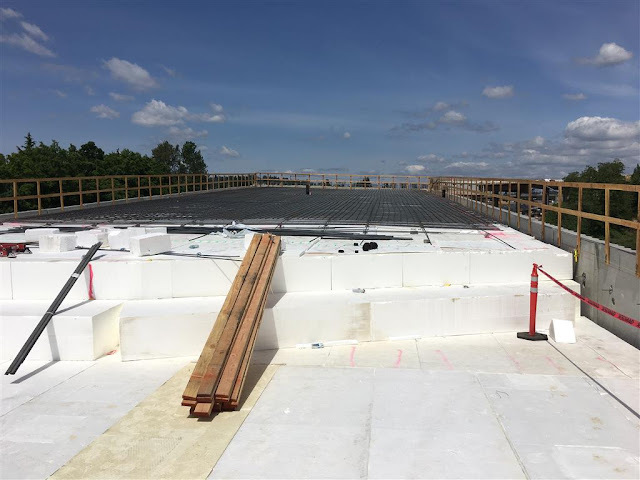 Using geofoam reduces the weight placed on the underlying soils, eliminates the need for that ground improvement process and speeds up construction. First, crews dig out a section of the ground that is greater than the weight of the geofoam. Then they place blocks of geofoam and stick them together with a quick-setting commercial roofing adhesive. Once all the geofoam is in place, crews tie reinforcing steel on top of it between the ramp walls and then pour concrete on top. Once the geofoam is in place, crews tie reinforcing steel on top before pouring concrete (above and below). How much does the geofoam weigh? The geofoam weighs a fraction of the weight of normal soil, yet it is just as strong because it is manufactured to meet the same strength standards as other methods. The dirt that crews dig out before placing the geofoam weighs more than all of the geofoam being placed. Each standard block of geofoam has a weight of 248 pounds. Once all of the blocks are installed, their total weight will be almost 700,000 pounds! If we used only dirt, it would weigh as much as 100 times more and have greater impacts on the ground in this area. Each standard block of geofoam weighs 248 pounds, and once they’re all installed the total weight will be 700,000 pounds. Using innovating materials and techniques helps construction crews complete our projects as quickly as possible. We realize that construction is disruptive to traffic and to the communities nearby, and we are working to bring travel benefits to the public as soon as possible. That’s why we are working with our contractors to look for innovative materials and construction techniques — such as geofoam — to complete our projects as quickly as we can. Travelers who use the Center Drive on-ramp to southbound Interstate 5 will soon see a change in how they merge onto the highway. As early as next week, contractor crews working on the I-5 - Mounts Rd. to Center Dr. Auxiliary Lane Extension project will stripe southbound I-5 to its final configuration of four lanes from the Center Drive overpass, with the lanes tapering to three near Mounts Road. This change adds some capacity to the interstate at this location. It also means that travelers entering southbound from Center Drive will need to merge left twice before reaching the Mounts Road exit. Currently drivers only merge left once. This work will require a series of overnight lane and ramp closures on southbound I-5 between Center Drive and Mounts Road. Crews will begin their work near the Mounts Road on-ramp to southbound I-5 and continue their way north towards the Center Drive overpass. Each night will involve a different section of southbound I-5 and associated ramps. Rain could reschedule the work. 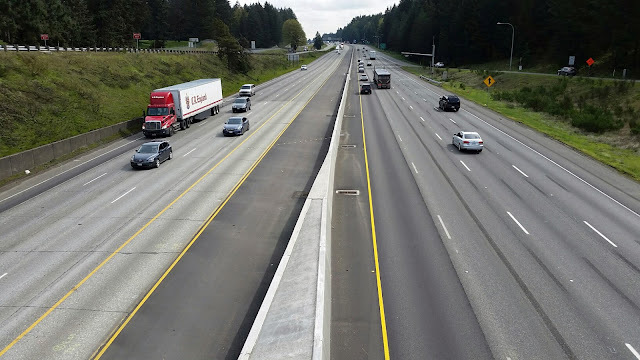 The auxiliary lane extension project is the first of a four staged construction project that widens nearly 8 miles of I-5 and rebuilds three interchanges between Mounts Road and Gravelly Lake Drive in Pierce County. southbound I-5 will be restriped to its final configuration. 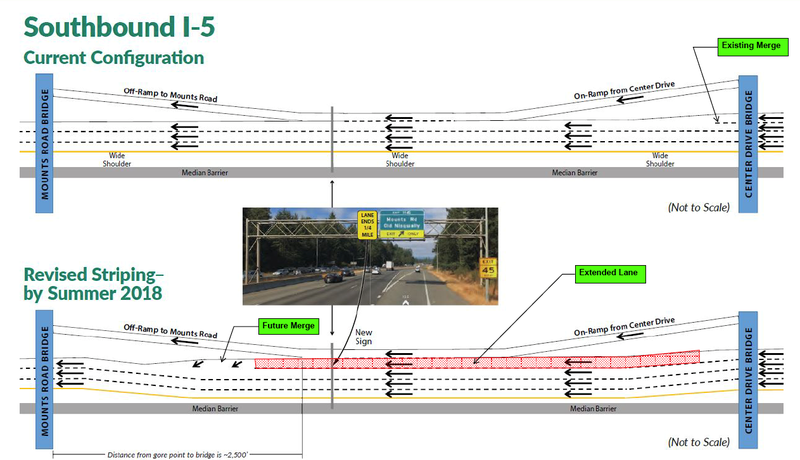 In 2017, I-5 was widened between Center Drive and Mounts Road to extend a northbound auxiliary lane from Mounts Road to Steilacoom-DuPont Road. This work required all lanes of I-5 between Center Drive and Mounts Road to temporarily shift toward the right shoulders, thus creating a work zone in the center median for the project. In November 2017, the northbound lanes of I-5 were striped into their permanent configuration and the new auxiliary lane opened to traffic. The wet winter weather prevented final striping in the southbound direction. After the southbound striping and final signage is installed, the auxiliary lane extension project will be complete. 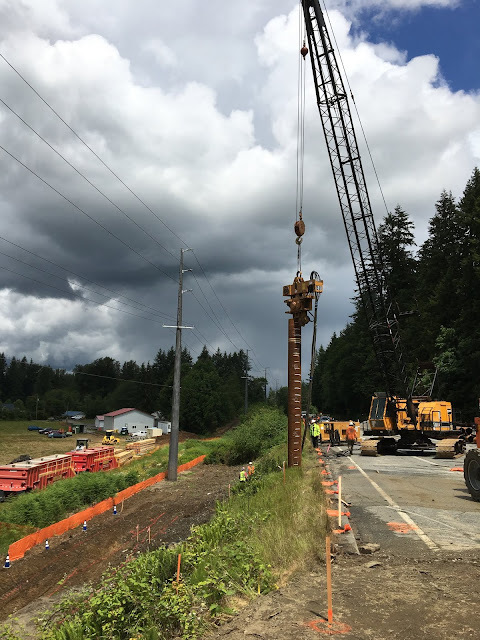 The second stage of construction that rebuilds the Berkeley Street and Thorne Lane interchanges and widens I-5 just north of Steilacoom-DuPont Road to Thorne Lane will begin early fall. It was an early September morning in 2017 and Kathy Vatter was almost on vacation. She didn’t know things were about to change. Driving conditions on State Route 512 in Parkland near Pacific Avenue were clear and dry, what some would refer to as a "calm night." But calm nights can change in an instant, as it did for Kathy, an Incident Response Team Supervisor and a 33-year employee with our agency. Around 3 a.m., Kathy received a call from our traffic management center that there had been a deadly collision on SR 512. She arrived on scene to set up traffic control, turning on her flashing orange arrows to divert and warn traffic away from the crash area. As cars flew by, Kathy noticed one particular vehicle that appeared to be approaching the scene and not slowing down. "It was in that moment I knew they weren’t going to move over and I needed to act fast," Kathy said. To avoid being hit, Kathy jumped over the highway guardrail. 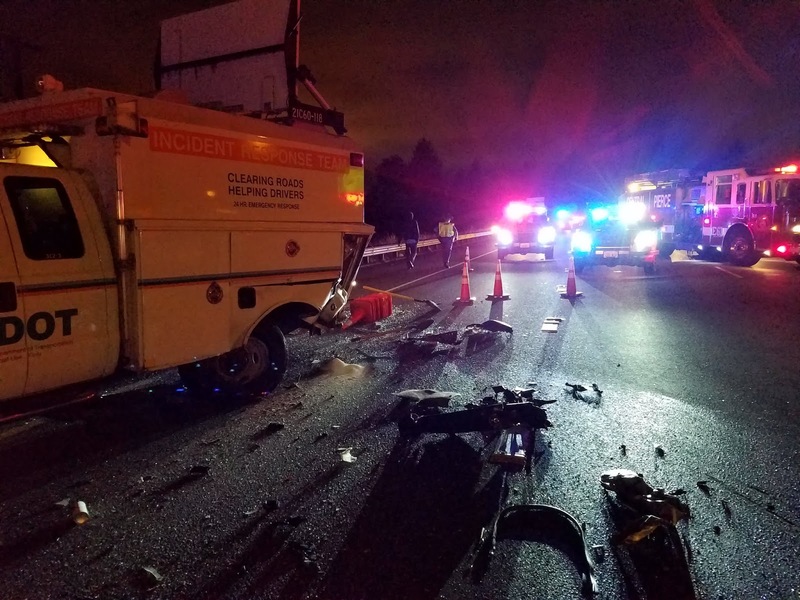 Within seconds, the oncoming vehicle slammed into her IRT truck with such force that both vehicles were totaled. 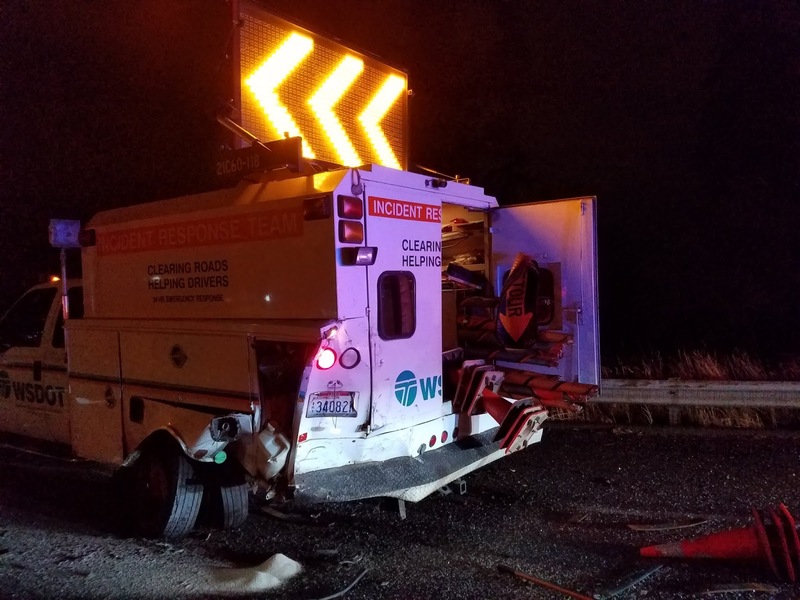 Kathy Vatter’s IRT truck was hit by a drunk driver on SR 512 in Parkland. "It seemed like forever," Kathy said. 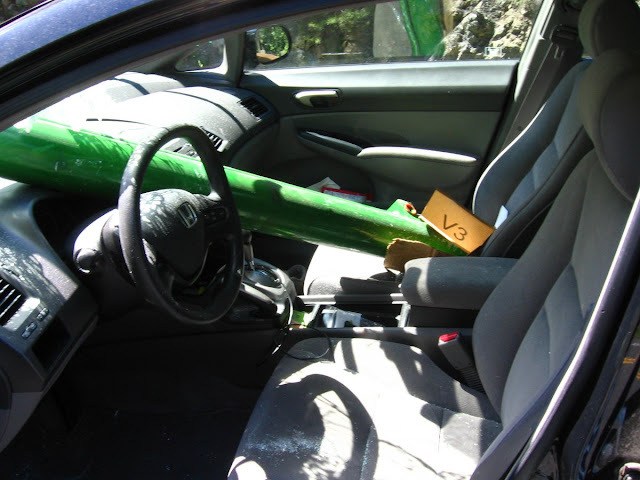 The causing driver was driving under the influence of alcohol. The driver’s passenger suffered serious injuries in the collision. That’s statistically common, as 96 percent of people hurt in work zone collisions are the motorist, their passengers or passing pedestrians. Fortunately, Kathy wasn’t hurt, and in fact helped direct traffic through the area while the State Patrol and emergency responders worked the scene. responders arrived on scene, while continuing to redirect traffic. Kathy was lucky, however many of our workers can’t say the same. Since 1950, we have had 60 workers killed on the job – many of them in marked roadway work zones. On average our state has 837 roadway work zone injuries annually. The guardrail where Kathy Vatter jumped to avoid being hit by an oncoming drunk driver. Luckily, Kathy’s awareness of her surroundings and quick action saved her from injury. "I want to live to retire," she said. "If I had been injured that night, our lives would look a whole lot different." 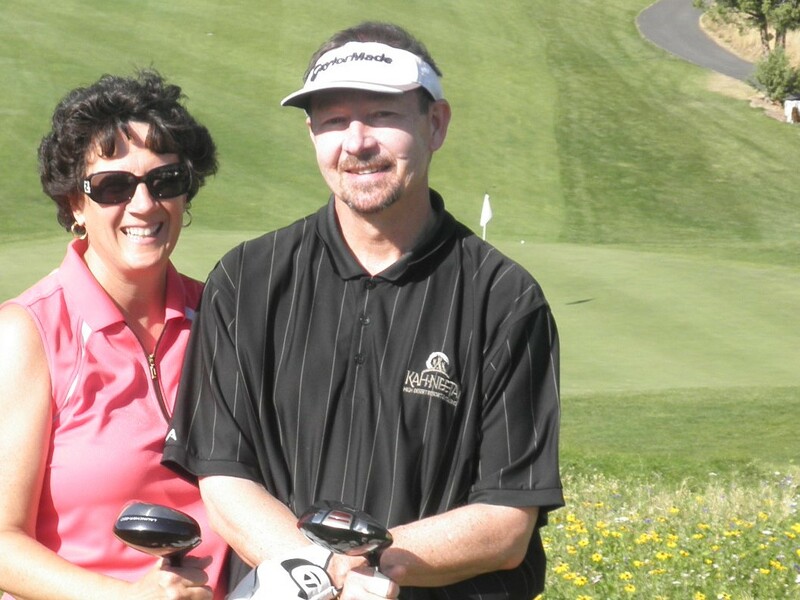 Fortunately, Kathy and her husband Ron are still able to enjoy their active outdoor lifestyle, including hiking and swimming. But all that could have changed in an instant. Kathy Vatter and her husband Ron celebrating his 60th birthday. "I am just glad it was me," Kathy said. "Someone with less experience might not have been so lucky and that would devastate our team." Slowing down – Drive the posted speeds, they’re there for your safety. Be kind – Our workers are improving the roadways and helping to keep you safe. Pay attention – Both to workers directing you and to surrounding traffic. Stay calm – Expect delays, leave early or take an alternate route if possible; no meeting or appointment is worth risking someone’s life. Remember, road workers have family and friends they want to go home to safely. Please do your part to help. "Lots of people forget we are humans too," Kathy said.